Recently SE Asia has attracted international attention both in the case of Malaysian Airlines MH370, as well as the sinking of MV Sewol. But besides these major occurrences, in this past week we also had some developments in maritime security for the region. Three incidents of armed robbery were reported and one hijacking. Of all these, the latter appears to be the most interesting; after all SE Asia has traditionally been a hive of piratical activity and a thriving business of armed robbery. But in 22/04, we had the second vessel hijack of the year and the first arrest of hostages for the area. 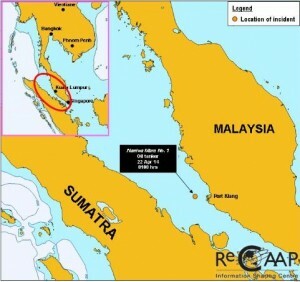 It all began when 26nm SSW of Pulau Aur in Malaysia, Japanese flagged tanker Naninwa Maru 1, was boarded by armed pirates and all the crew was locked in a room. Subsequently two vessels approached the tanker and siphoned off 2,500 tonnes of the vessel’s cargo. When the pirates left the vessel the crew noticed that the ship’s master, chief engineer and chief officer were missing along with their passports. To this day no contact for ransom has been made, either to the owning company or any authority, so the apparent assumption is that the crime was committed with the cooperation of the three officers. Leaving aside the assumption that the three senior officers of the vessel were collaborating with armed criminals, the incident is new for the region where the mainstream was petty theft and not an elaborate scheme including other vessels and a parallel market to absorb the stolen goods. Such incidents have been recorded in West Africa but for SE Asia it is very rare. This could be an isolated incident, but it could also be the first occurrence of a new trend that formulates in the area. In either case we should be vigilant for similar cases in the future. Furthermore this week the International Maritime Bureau published its report for Q1 2014 piracy statistics. What we observe is that SE Asia still is the region that produces the most maritime security incidents in the world, albeit mostly armed robberies and again reduced in comparison to the equivalent quarter of 2013. This does not come as a surprise since regional geography and the political situation there, has traditionally served as tinder for such incidents. Thus we advise that vessels operating in the area should always exercise caution, remain highly vigilant and properly protected. Tagged incidents, piracy reports, SE Asia.